There are no windows on the unreserved cars of Indian trains. I mean, there are windows, but no glass. No screens. No barriers. There aren’t doors, either. Just openness. Windows you can stick your hands out of and feel the breeze as the train blasts through the palm-treed countryside. Doorless door frames open to the elements, wide enough for me to sit comfortably and dangle my legs off the side of the train car while Dad stands beside me looking out over the South Indian splendor. We pass an old man with knobby legs and hardened bare feet herding goats in his dusty yard. A teenaged boy in bright red tee shirt talking on his cellphone leaning against a rusty train trellis. An open-air school house noisy with uniformed school children playing in the yard. We fly by an evening market selling Christmas ornaments, large paper stars and Santa masks. By shacks with thatched palm roofs and track-side tin roofed homes. A solitary old woman sitting on her step watching the train go by. A glowing girl walking home on the dirt path in a turquoise kurta and bright purple dupatta. The smell of rubber trees blows in, jasmine, incense, pee, bananas. We pass a man standing next to tracks with a beedi tucked in his mouth, wearing only a lungi, carrying a giant bag of rice on his head. A father lifting his baby daughter into her mother’s arms, fresh from bathing in the river. A year of change and letting go. Of shedding layers of myself that I once needed that no longer serve me. A year of planning and realizing that no amount of time and energy and planning could have prepared me for what is unfolding. A year of long hugs. Of understanding, deep in my core, just how much love I have in my life. A year of laying myself bare to a new place, new people, new ideas, new challenges. I feel a momentary fear of falling from the open train; the same feeling I had in my stomach this year when I signed my contract and when I said goodbye to my Classical community. I feel that same crazy, reckless feeling that I had when I sat eating bagels that last day with Carla and Bethany, when I hugged my family before leaving for the airport, when I let go of Reg’s hand. This year of crazy, reckless, wonderful life. I breathe deeply and know I am grounded right where I need to be right now. I feel a rush of gratitude. I feel free; no barriers, just openness. The train car is gritty from the wear and tear of years of passengers making their way from one place to another. 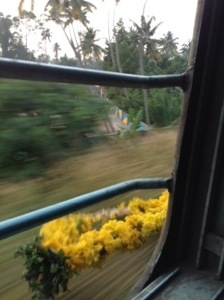 WJ is tucked tightly in between four other passengers, the sun begins to set over the backwaters and Dad’s marigolds blow in the wind as our train makes it’s way forward. You paint the best word pictures! This absolutely transported me there with you, riding along, dangling our legs out the door. India! Oh India! So much joy. Your every word was like a beautiful bird flying free! Love you. So vivid your description of everything Susannah! I love it! !